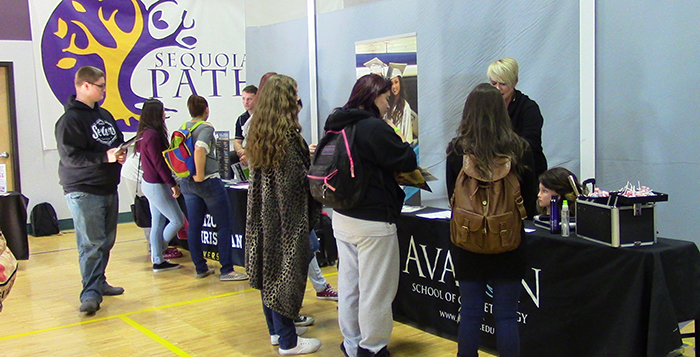 The Nelson C. Lathan Counseling Center presented a college fair at Sequoia Pathways Academy to help local students see how many options they have for a post-high school education. The event brought in four-year universities such as Arizona State University and Grand Canyon University, as well as two-year schools such as Central Arizona College, military entities, cosmetology schools and trade schools. The event was presented by the NCLCC to promote the organization’s “Roads to Scholars” program. The Nelson C. Lathan Counseling Center is a nonprofit organization based in Maricopa. To find out more information about upcoming events or programs, visit www.nelsonclathancounseling.com.